Hanging cheer camp door decorations is a time honored cheerleading tradition. Get some great ideas you and your squad can use to show other campers exactly who you are and the kind of spirit you have! Cheerleaders are full of spirit and enthusiasm, not just for their own sport but for their squad, their school and their teams. Sharing that spirit happens in many ways, and decorating your door at cheer camp is definitely one of them. A good deal of cheer camps are week long events where participants gather and actually live at a central facility for an entire week or weekend. The experience is a lot like living in a college dormitory, and these camps bring cheerleaders together from many regions. It's only natural that squads want to let everyone know who they are and who they represent. 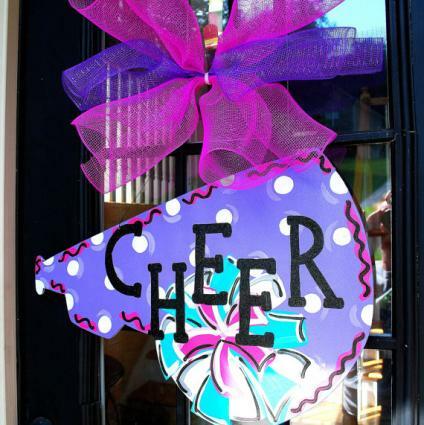 Creating personalized cheer door decorations can accomplish that mission in many ways. Before you put a lot of work into creating a door decoration for your room at cheer camp, it's important to find out whether decorations are allowed at all. Some facilities consider anything that hangs on a door or wall to be a potential fire hazard, so their building code may not allow decorations. Read all the materials that come with your squad's camp registration. If the issue is addressed directly, you'll know whether or not cheer camp door decorations are allowed. If there is no mention about decorations, get in touch with the camp director, (this info should be listed on your registration) to find out if they are allowed. Don't assume that door decorations are still welcome even if you've attended a particular camp in years past. Rules do change, so make sure you understand the current regulations. It can save you both time and disappointment. Once you've made sure door decorations are allowed at the camp you plan to attend, it's time to get some ideas flowing. Perhaps one or more of the following ideas will help your squad figure out what they want to do. Most squads want to incorporate the name of their school or organization and mascot into their decorations to let people know who they are. This alone can provide a theme. For example, if your school is known as the "Fighting Irish", you may want to consider elements like a pot of gold, a leprechaun or four leaf clovers. If you choose clovers, you could add the name of each cheerleader staying in the room to a leaf. You can create the design on a poster board, add your school name and sprinkle on some glitter for more flair. Every school has its traditional colors, and these can be used as the basis for your door decorations. If you're affiliated with an all star cheerleading squad as opposed to a school organization, use your team's uniform colors for inspiration. You can purchase satin ribbon and wire to make festive bows. Leave the ends long like streamers, and use stick-on scrapbooking letters to add your team's name. Add curling ribbon, glitter or anything else you'd like to make your decoration really stand out. Some camps allow you to hang or tape decorations to the middle of the door, but some encourage you to decorate with a door hanger instead. This type of decoration attaches to the door handle. In cases like this, trailing ribbons look terrific as long as they aren't long enough to interfere with opening and closing the door. Tie a small stuffed mascot on as further embellishment. Going back to the Irish theme as an example, you could also hang a small basket painted in your school's colors and fill it with gold foil covered chocolate "coins" to share with fellow campers. At camps that allow you to go "full hog", consider wrapping the outside of your door with wrapping paper and then adding ribbons, signs and anything else you'd like to show off your squad spirit. If the pattern isn't too busy, the paper could actually serve as an autograph area that you can carefully remove and take home with you when camp is over. Your school store: You can usually find stuffed mascots, felt pennants and school T-shirts that can all become inspiration for unique door decorations. Craft stores: Craft stores carry everything from ribbon, to glitter to wood cut-outs and paint. If you don't have inspiration before you walk in, you're sure to find it once you see what's available. Scrapbook supply stores: Similar to craft stores, scrapbooking supply stores have dozens of interesting embellishments and idea sheets. If you find a scrapbook page style you like, think about enlarging it to encompass a dorm door. You can even add pictures of your squad to complete the scrapbook theme. As you can see, you're only limited by your own imagination and the camp's regulations when it comes to door decorations. Just make sure you gather ideas from all squad members and try to reach a fair consensus of how you want to represent yourselves. Most of all, remember to have fun!